Epson’s interactive projectors in schools are all about making learning more engaging. With a lot of experience producing interactive education projectors, it’s no wonder that education institutions are abandoning interactive whiteboards, large format projectors and display panels in favour of Epson’s interactive projectors. 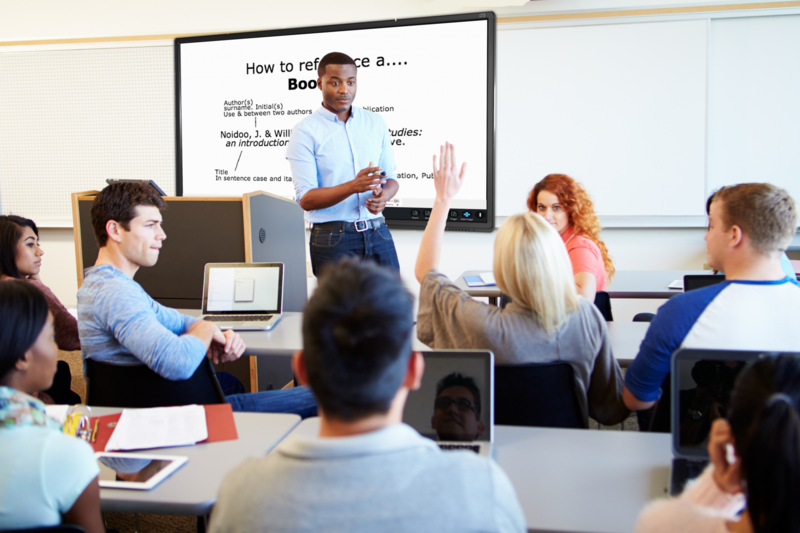 Better value and more versatile, an interactive projector provides a fuss-free all-in-one solution that makes education a more collaborative and fun process than ever before. So what makes Epson’s interactive projectors for Melbourne and Australian schools, classrooms, boardrooms and meeting rooms so great? Interactive projectors are all about encouraging collaboration. 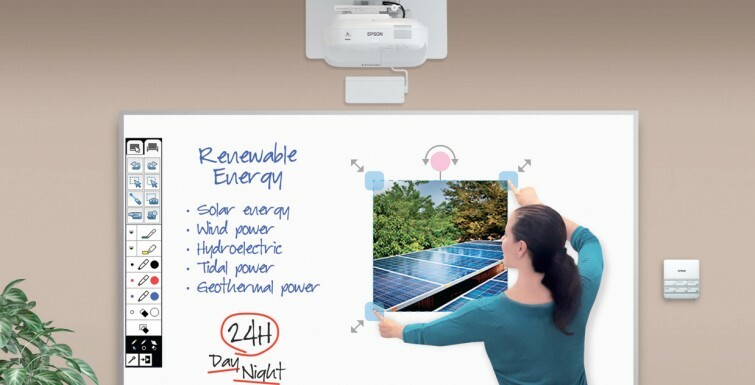 Take Epson’s popular EB-695Wi projector; it uses two interactive pens, which allows a teacher and a student – or ten students – to write on the same screen at the same time. Responsive and easy to use, these pens also have a ‘hover’ function that accurately detects when they are not in contact with the projection surface. These interactive projectors encourage collaborative learning by placing the teacher and student at the front of the room in an inclusive and constructive environment. Whether you’re connecting to the projector wirelessly or via hard cables, you’ll be able to annotate, write and draw over any laptop and/or in-built document. Smart apps & tablet integration. Epson’s ushering-in of a new era of interactive projectors goes beyond collaboration to achieving an advanced smart learning platform for schools. Using the Epson iProjection app for tablets and smartphones, a teacher can annotate the onscreen image from a mobile device, and so can students. Not only can you project content from smart devices, but the PC-free annotation whiteboard mode means that teachers don’t even need to power up their computers. You can also download and install your own finger-touch-compatible apps to your PC or tablet device, using Epson’s interactive projection technology to engage and foster a developing academic environment. Show off movies and YouTube video clips in class. Another string to the interactive projector’s bow is its ability to annotate directly onto videos in class, which is an increasingly important part of the content mix in schools and colleges. Whether you’re playing a video directly from YouTube or streaming from your local hard drive, Epson’s interactive projectors make it easier to discuss video clips as part of any teaching curriculum. Taking advantage of existing infrastructure. 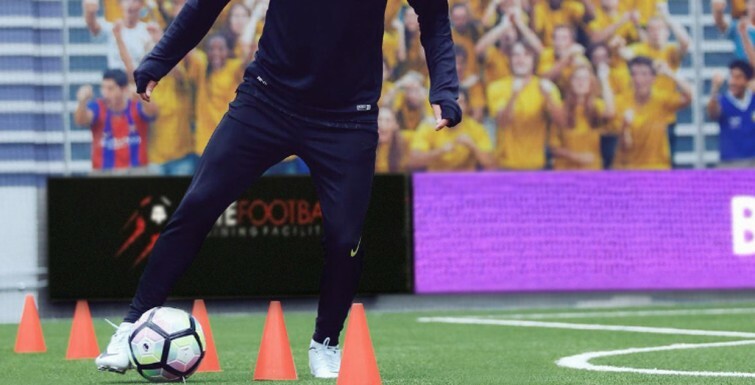 For many institutions a big advantage of installing interactive projectors in Melbourne is that no other upgrade is needed; existing whiteboards or interactive whiteboards can stay because interactive projectors can project an image onto any surface. So exciting, yet simple is the technology that it’s likely that, at first, many students will want to see exactly how their classroom’s new interactive projector works. Super bright and detailed images. Epson’s expertise in projection, and the development of its own powerful 3LCD system, means that image quality from these products is second to none. Projecting a White and Colour Light Output of up to 4,200 ANSI lumens, images are crisp, vibrant and colourful – and, crucially, remain so even in bright daylight. A learning experience that’s more involving and more fun is always going to increase students’ motivation and produce better results. 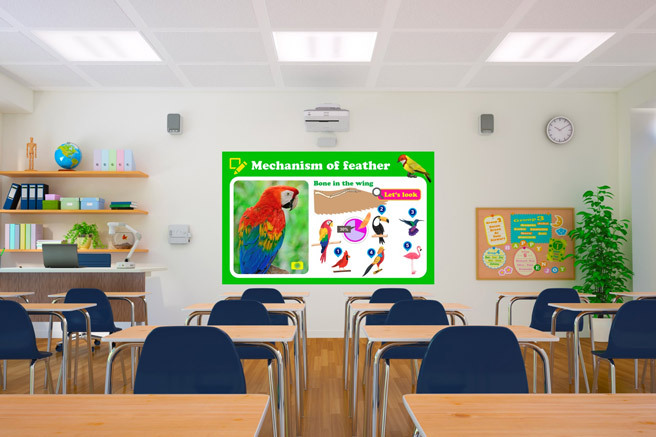 Hugely versatile interactive projectors help achieve this by broadening the possibilities for teachers’ classroom methods. Teachers are limited only by their imagination and their commitment to taking advantage of the technology’s features. 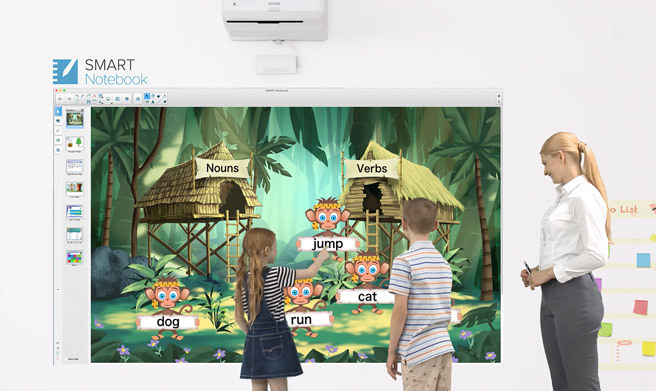 Epson’s interactive projectors are rapidly being adopted throughout education, and the reasons are as simple as the products’ design and features. Is there any more exciting use for new technology than to help encourage collaboration and engagement in learning? If you’d like to learn more about how Epson interactive projectors can benefit your Melbourne school or business, contact Vision One today on (03) 9467-3777. Just like with purchasing a house, buying a touchscreen can be a daunting task for first time buyers. Buyers do not necessarily know the right questions to ask, which is why we have broken down 10 things every touchscreen buyer should know. You want all content displayed on the screen to be clear and legible to all your class wherever they’re sitting so it’s essential to have the right size of screen for the size of space. Touch screens are available up to 105-inch in size so there’s going to be a size to suit all spaces. Don’t be afraid to ask a trusted supplier to advise you on the optimal size for your room. Remember, touch screens can easily be moved when mounted on a trolley and are bright enough to be used in a variety of spaces such as libraries, staff rooms or the assembly hall. There are different grades of panel from B to A++ with A++ the best quality. To achieve top grade, the panel should have virtually no flaws such as dark or light spots, light leakage round the edges or other blemishes, which affect the quality and uniformity of the image reproduction. The lower the grade, the more flaws are permitted. The highest-grade panels tend to be more reliable and have lower failure rates. Less than 1% failure rate is very low so ideal; 2-4% is mid and 5-9% is high and 10% and above is a very high failure rate. Touch screen models use a variety of touch technologies. Most now support multi-touch of 2, 4, 6, 10 or 32 simultaneous touches. Two is the minimum needed to pinch, zoom, double-tap etc. – the touch gestures we’re all used to from our smartphones and tablets. Four is the minimum you’ll need if two people are to use the screen at the same time. If your screen will be used as a touch table, opt for as many touches as possible so students can work together in groups around the device. Multi-touch is not the same as multi-user so ensure you test this in a demo. Don’t forget, there are also other ways to interact with your touch display from tablets or laptops using software like DigiClass to connect up to 40 iOS, Android and Windows devices wirelessly. You want to be free to use the software of your choosing in your school, college, university or office so make sure there is nothing to restrict that choice. 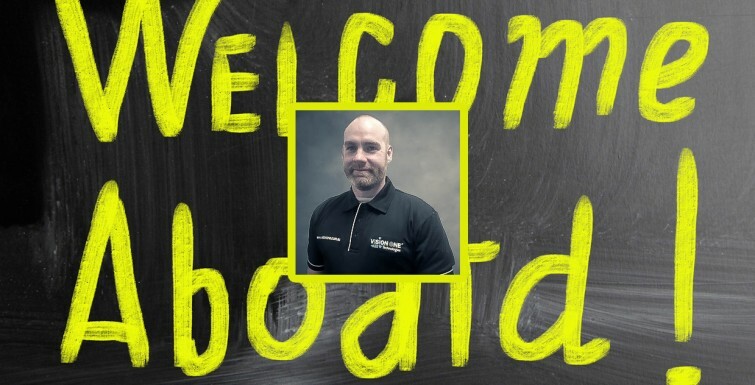 You will however, definitely need tools that provide flawless whiteboarding and the ability to annotate and connect to tablets and use them as voting handsets or as cameras/visualisers. School users will also be glad of tools that make your lives easier, like the ability to open native Smart and Promethean files so there’s no need to recreate all those lessons you’ve accumulated. Software can sound good but be disappointing in use so the best way to assess the software provided is to download a trail version and try it out yourself. Video-conferencing and screen recording are fantastic tools for connecting to other schools and organisations, enabling students or teachers to connect in from home, another classroom, school or anywhere they happen to be. iBT’s screen record built-in to IWBpro is also a great way to create revision resources for your students and prepare materials for use in flipped and active learning. A long cabled webcam can also be invaluable for use as a standard video camera which can be incorporated with our ‘visualizer tool’ to project the image from the camera on the screen. 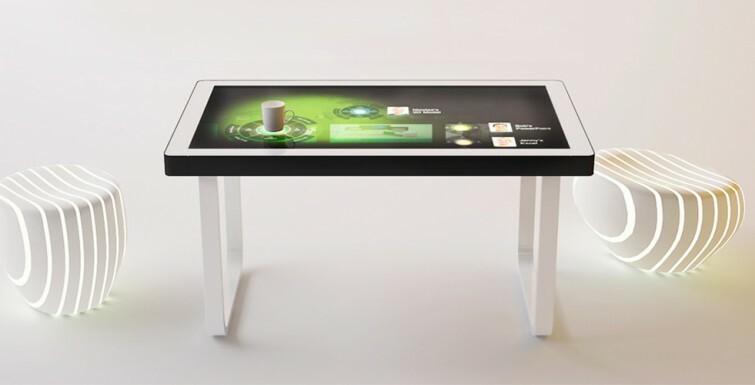 Your new touch screen will have a much longer life than your old projector and whiteboard. Today’s touch screens will typically still be working at full brightness in ten years time so it makes sense to not only consider what you need today, but what your teachers and students will need in the future. Choosing a solution with MS windows compatibility and Android will be vital. Get the best of both worlds with quick access to apps for use on the screen at the click of a button. Apps will become an important tool in the digital classroom of the (near) future so ensure your front-of-class screen has Android for complete versatility. In the end purchasing a touch screen is like making any other big purchase. It requires research and thought. Whether you are a first time buyer or looking to upgrade your exisiting touchscreen, make sure you take in to account the 10 Things Every Touchscreen Buyer Should Know. Samsung has a vision for a “workplace of the future” – and it includes a giant, rotating, digital whiteboard that can screen mirror your phone and have four people writing on it at the same time. 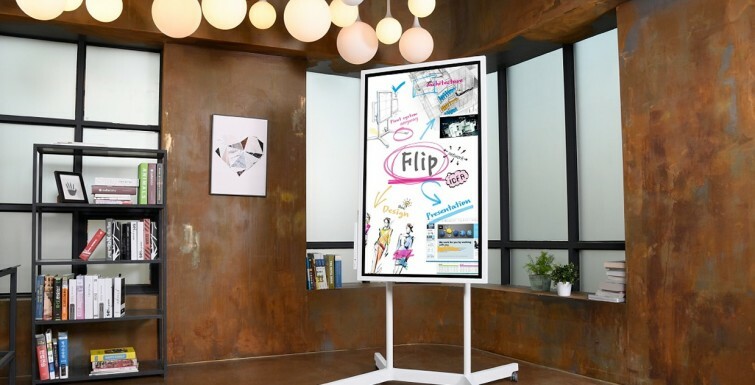 Samsung calls the Flip WM55H “an upgrade on both standard paper flip charts and analog boards” – basically packing a host of digital features into what aims to still feel like a traditional whiteboard. The Flip is on wheels, is height adjustable and can also be wall mounted either horizontally or vertically. “The often-flawed logistics of the modern meeting make it easy for participants to feel disengaged and for vital ideas and discoveries to become lost,” said Seog-gi Kim, Executive Vice President of Visual Display Business at Samsung Electronics. Up to four people can use their fingers or a special dual-sided pen (one side is a highlighter, which is very cool) in unique writing styles, sizes and colours so you can tell them apart. But it’s not just the pen or your finger (your palm acts as an eraser), you can add content via wireless connectivity, USB, PC, mobile ports and NFC. There are 20 “pages” of space on the Flip, and each can be searched. Once you’re done with your meeting/session, the content is stored in a central database behind a password lock. When you log back in, you can download and share the content through email, save it to a USB or external hard drive – or you can even print it, if you’re old school. Happy Halloween From the Team at Vision One! Vision One expresses its scariest wishes to our clients and their families over the #Halloween holiday period. 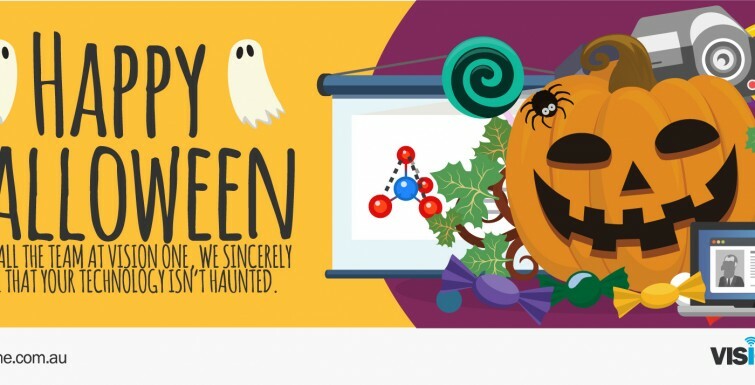 On behalf of the entire team, we sincerely hope that your technology isn’t haunted. Happy Easter From the Team at Vision One! 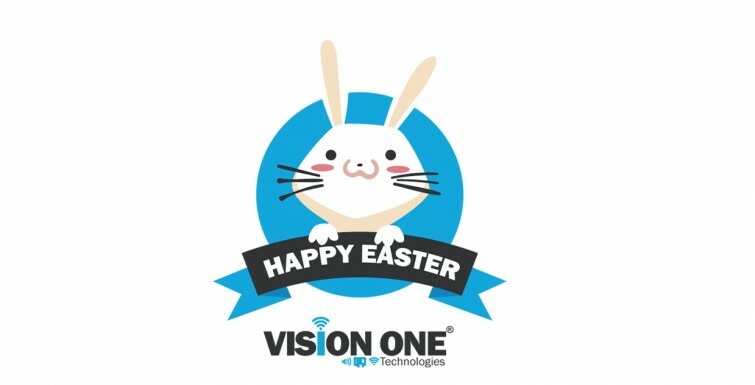 Vision One expresses its warmest wishes to our clients and their families over the #Easter holiday period. May your chocolate eggs be aplenty and we’ll see you all on Tuesday! Userful video walls use standard, off-the-shelf server or PC hardware and network zero client devices connected over a standard gigabit Ethernet network. Single install setup turns a standard Intel Core i7 PC into a browser-managed video wall controller. Optionally add extra Nvidia video cards which are used by Userful software to offload video rendering thereby increasing the power of the PC and the number of screens and size of content supported. Arrange video walls in standard grid or artistic formats. Rotate individual displays to any angle to create a unique video wall. Add virtually unlimited content inputs from just about any source: Local CMS player, Live TV, RTSP, RDP, VNC, an interactive desktop or full screen browser or just about any content using one or more HDMI or SDI capture cards. Preset zone support allows for the display of simultaneous content streams on specified displays within the video wall which can be changed on the fly as needed. 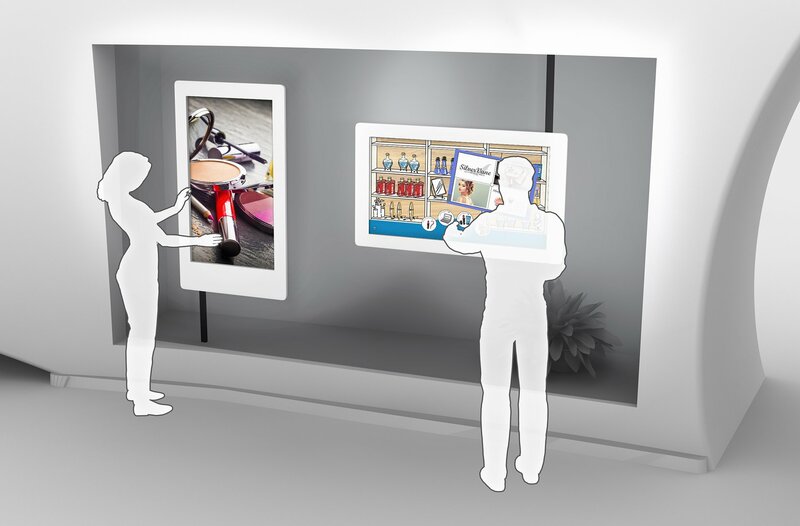 With a single touch customers can instantly change the content playing on the video wall using a smart phone or tablet. Userful has a powerful suite of control tools. Administrator can preset zone and content options for all displays, and then staff are able to invoke those presets using a tablet or smartphone switching content and zones across all video walls and displays with a single touch. Userful also allows users to control the mouse and keyboard of an interactive video wall from a smartphone or tablet. Ths effectively turns every video wall into a touch video wall. 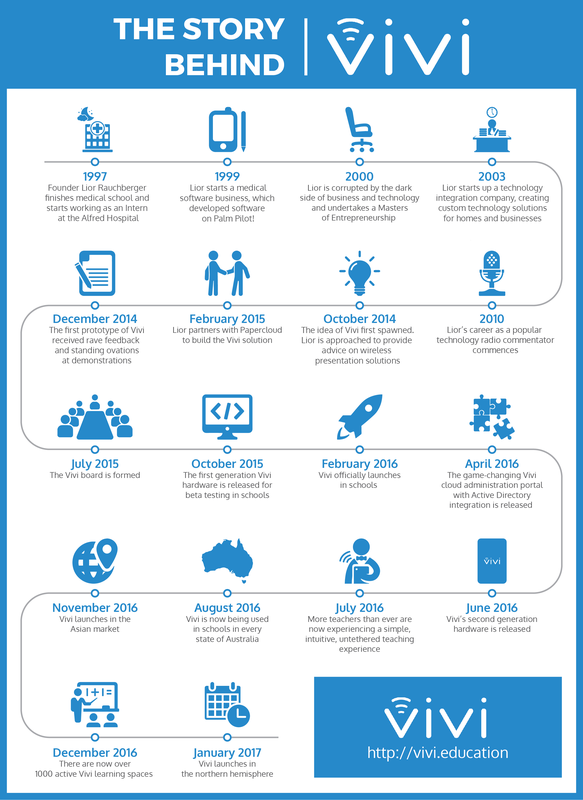 The Userful platform began as a virtual desktop solution, reducing the cost and simplifying desktop deployments around the world. Delivering cost effective centralized and virtualized desktops however was just the beginning for Userful. Since then, we’ve developed our software platform to do amazing things for displays of all kinds. 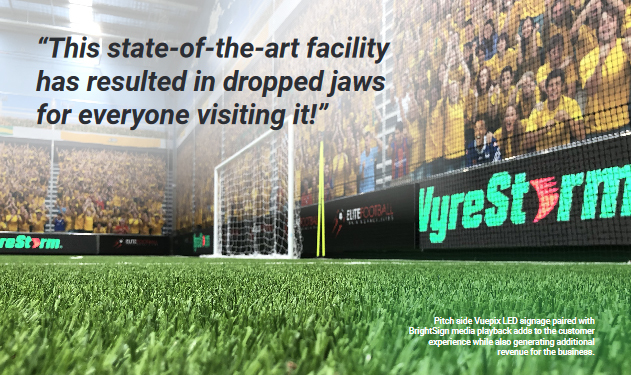 Userful also supports high performance video walls, digital signs and locked down kiosks that are easy to manage, cost effective to deploy. From interactive video walls, to artistic, mosaic-style video walls, or simple control room applications, Userful is a high-end video wall controller that makes it easy to synchronize and add intelligence to displays. With a brightness level of 3,800 lumens and FullHD WUXGA resolution, the EB-696Ui’s ultra-short-throw design allows you to present large images from a very short distance. Check out this promotion video for Epson’s new EB-696Ui ultra short throw projector. 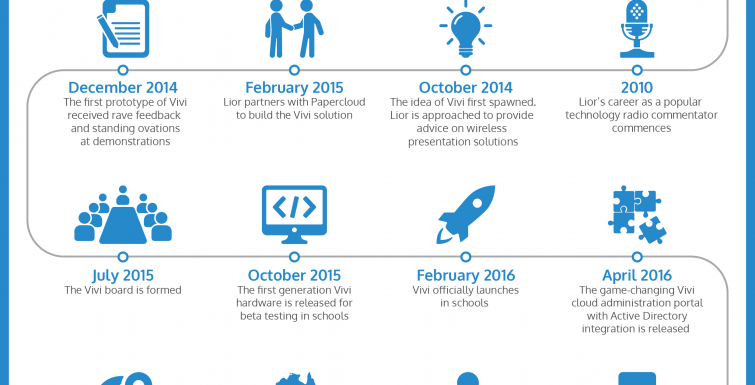 Check out this awesome infographic from Vivi Australia, outlining the brand’s timeline from 1997 until 2017!